Presumably, you follow the direction of the road (to the right), turn first left, turn left again, and then turn right. But is that what the sign says? Do the three right-facing arrows simply mean that you follow the road to the right before taking the first turn left? 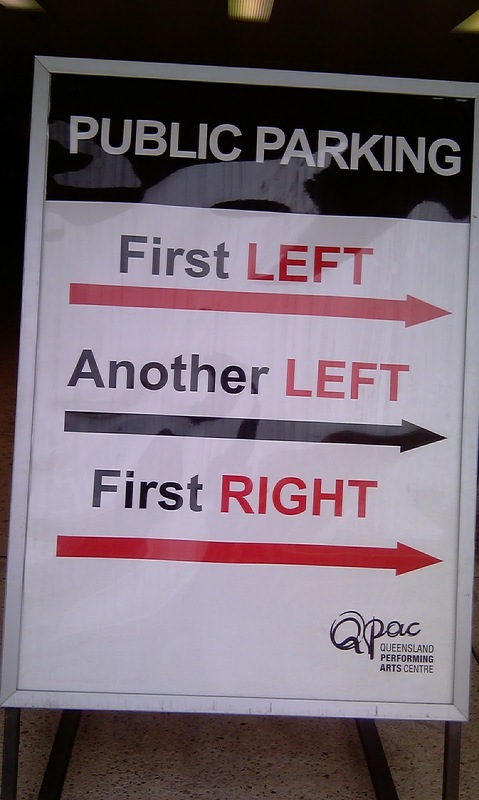 Is it confusing to write ‘first left’ while giving the visual signal to go straight to the right? Are you supposed to follow these instructions in sequence to lead to one parking station? Or are there three options for parking, as indicated by the different colours on the arrows? The really confusing thing about this sign is that the reader isn’t given a context in which to understand the instructions. If the sign named the parking station or the street where the parking station is, it would help enormously. 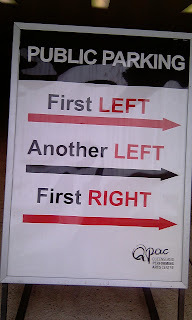 It would also help if the first street on the left gave a supporting sign (turn left here for parking). But no, the next street says that parking is straight ahead, and that turning left takes you to a drop-off zone. Good thing I was walking past, and not trying to park!